My core was hot from the steady incline over the past mile and a quarter, but my ears were cold from the wind, so I decided to make better use of my sweatshirt. This photo was taken by my friend Julie, who was quite amused. 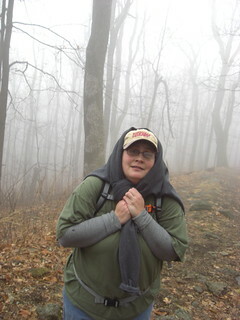 I'm hamming it up for the camera, and enjoying the brief respite from the hike.